We are the largest one site combined Sports Medicine, Research and Performance facility in Europe seeing over 55,000 patients a year. We believe that all patients, regardless of their injury or the level of activity they wish to return to, should receive the highest standard of care delivered consistently across our entire department. We are the largest one site combined Sports Medicine, Research and Performance facility in Europe seeing over 55,000 patients a year. We have developed our rehabilitation process, called SSC 6, to ensure this consistent individualized approach to patient care. While recovery and rehabilitation are individualized processes with recovery timelines specific to each individual patient, we actively track your progress through the SSC 6 using our data analysis systems. This ensures that your progress is as expected relative to the normative data we have from our 50,000+ other patients annually. This allows us to accurately guide your recovery time, to focus your goal setting and actively intercept any outliers to ensure consistency of outcome across all our patients. At SSC we combine clinical expertise, cutting edge technology and data analysis techniques to ensure every patient achieves their desired outcome. The SSC 6 combines the expertise of our multidisciplinary team. Led by our Sports Medicine Consultants, the first step is to obtain a specific diagnosis using the most cutting edge diagnostic technology. This ensures your diagnosis is made as efficiently as possible and all the contributing factors that have led to the development of the issue are accurately identified. 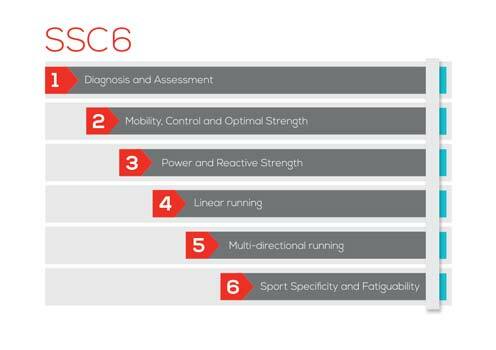 The SSC 6 then guides you through our steps of rehabilitation. We believe in combining world class care with cutting edge research to ensure the delivery of the highest standard of care. This is why we have research programmes and PhD studies embedded in all our clinical pathways. Our rehabilitation team combines the skill sets of our Physiotherapists, Strength and Conditioning Coaches and Biomechanists to deliver comprehensive rehabilitation solutions across all injuries and activity levels. All our clinicans are trained in strength, power and linear and multidirectional biomechanics development to ensure the highest quality outcomes. Initial appointments are usually thirty minutes with a Consultant Physician, although some specialist clinics are one hour. Following that appointment you will be referred to our stream programs for rehabilitation. These are delivered by Physiotherapist's, Biomechanist's and Strength and Conditioning Coaches. We use data analytics to track your rehabilitation progress compared to others with your injury. This gives us a better idea of the time and cost of your recovery. We also run a large number of research programs which may offer you access to innovative treatments and improve outcomes.